In my position I receive a lot of the same requests via email from many different people on a daily basis, from quick fixes, to questions on simple how-to projects. I used to spend a lot of time searching through past emails I had already written trying to find the information to forward again. That all changed when I was introduced to Quick Parts. Quick Parts is an insert option available with the desktop version of Microsoft Outlook. It allows you to save text and images that you have created in an email so that it can be pasted into the body of another email at a later date. This keeps you from having to search for directions from a past email to include in a new one. Here is how it works. Once you have written the initial email and have your directions and images the way you want them, highlight the section you want to save and use later. From the Insert tab, select Quick Parts and then choose to Save Selection to Quick Part Gallery. A new window will pop up prompting you to name your new selection. Choose a name that will make it easy for you to identify when you need it later. Once you save your selection it is available to you in the Quick Parts section any time in the future. 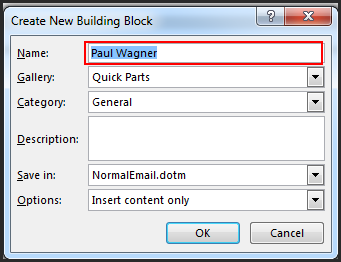 When you need to use one of your quick parts in a new email, return to the Insert tab and once again select Quick Parts. All the quick parts you have created and saved will appear alphabetically by name. Scroll through to find the one you need and click on it. Your quick part will be pasted into your email at the spot your cursor was sitting. 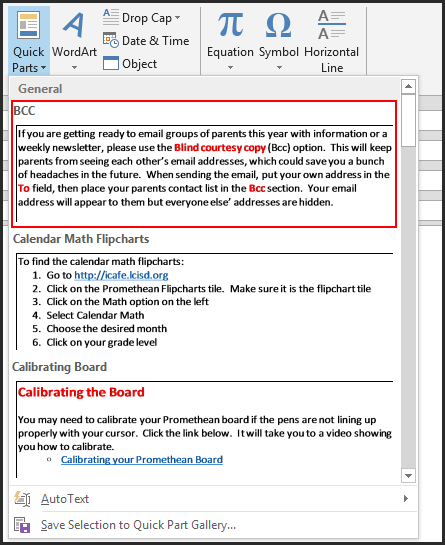 Some examples that I use quick parts for are: changing resolution on a computer, choosing to duplicate or extend your desktop, calibrating an interactive white board, installing certain software…the list goes on and on. Now when these email questions come through I am able to respond within seconds and then get back to other tasks that need my attention. ← Apps Can Be a Smashing Success!